The Southbridge Garden Club has been invited to exhibit at Worcester Art Museum as part of the museum’s annual Flora in Winter event. The Southbridge Garden Club will provide a floral interpretation of Claude Monet’s art and gardens for the museum lobby during the event that runs from Thursday, January 24 to Sunday, January 27. We interviewed Sandra Polanik, Public and Internal Events Coordinator for Worcester Art Museum about Flora in Winter. Be sure to catch the dates and times of Flora in Winter at the end of this article, along with the variety of activities and events that are available during the span of this exhibit. SC: How did the Southbridge Garden Club become involved with Flora in Winter? SP: Flora in Winter is an extremely popular annual event which is planned 11 months out. 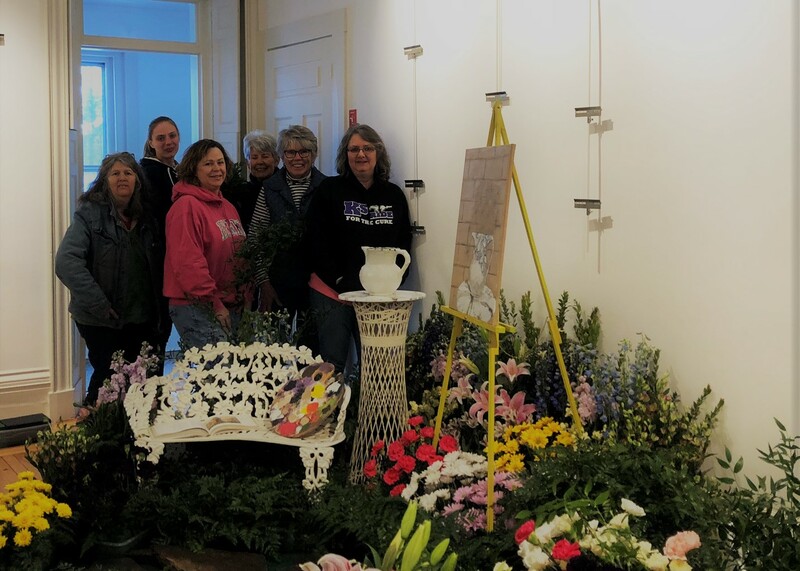 We had an opportunity for a local garden club to decorate the museum’s main entrance lobby and invited the Southbridge Garden Club to create a special display for visitors to enjoy. This is an important location; the flowers fill the lobby with color and fragrance and give visitors the first glimpse of Flora in Winter! SC: How was the decision made to have Southbridge Garden Club interpret the work of Claude Monet? Karen Ballou and other members of The Southbridge Garden Club prepare for the garden club’s exhibit at Worcester Art Museum as part of the museum’s Flora in Winter event. SP: Each Flora event has a unique theme. This year, Flora in Winter coincides with the opening of the special exhibition, Monet’s Waterloo Bridge: Vision and Process. SC: Is this the first year that Flora in Winter has been offered? Please tell us more about the event. SP: 2019 marks the 17th annual Flora in Winter. It is a four-day event that features art-inspired flower arrangements from many of the region’s top floral designers. Over the duration, 6,000 visitors flock to experience Flora. Designers are invited to participate and are paired with specific works of art from Worcester Art Museum’s permanent collection, which will fill the museum with decorative creations intended to provoke sensations of sight, smell and symbolism. Each year, different works of art are chosen for interpretation, so every year is different. In addition, commercial floral designers and garden clubs decorate public spaces around the museum with a variety of flower displays. This is an opportunity for them to showcase their expertise and skills in floral design. The museum is literally filled with flowers! Over the years, the current chairs (Kim Cutler, Sarah Ribeiro, and Kathy Michie) have committed to finding the finest regional designers available and keeping the quality of the arrangements and events high. SC: What other aspects of the exhibit or educational activities will be available to the public? A variety of exciting programs enrich the event – guided tours, demonstrations by expert floral designers, lectures by James Welu and Kim Cutler, performance by the Seele Musicale Chamber Ensemble and performance by Paul Buono and his quartet of jazz veterans to name a few. SC: What is your connection to the Southbridge Garden Club? I am a Charlton resident and member of the Board at the Ruth Wells Center for the Arts in Southbridge. Having first-hand knowledge of the stunning artistic work of the Southbridge Garden Club, I felt that this group of creative designers would be most worthy to fill the spot in Worcester Art Museum’s highly acclaimed exhibit. SC: Would you like to add anything else that I may not have asked about? SP: When we open our lives to the artistry around us we are enriched in unimaginable ways. If you come to experience Flora in Winter at Worcester Art Museum, you will not be disappointed! The 17th–annual Flora in Winter, one of Worcester’s most beloved traditions, takes place January 24 through 27 at the Worcester Art Museum, 55 Salisbury Street. For four days, dozens of imaginative floral displays transform the Museum into a wonderland awash in color, light, and a profusion of delicate perfumes—the perfect antidote to winter’s icy grip. Floral designers interpret works from WAM’s permanent collection and fill the Museum with decorative creations intended to delight and amaze. This year, Flora in Winter coincides with the opening of the special exhibition, Monet’s Waterloo Bridge: Vision and Process. Related programming inspired by Claude Monet, one of the most celebrated Impressionist artists, is scheduled throughout the event. Flora in Winter is free for Museum members, $22 for nonmember adults, and $6 for youth. Separate ticket prices apply to some Flora programs and events; admission discounts may not be applied during Flora. More information about Flora in Winter can be found at worcesterart.org/flora. Flora in Winter is funded in part by The Spear Fund for Public Programs and sponsored by United Bank Foundation Massachusetts. The public is invited to Water Lilies to Waterloo: An Evening of Monet and Flowers, an Opening Party celebrating both Flora in Winterand the exhibition, Monet’s Waterloo Bridge: Vision and Process, on Friday, January 25 from 5:30 to 8pm.A perfect fusion of color, light, flowers, and art—this festive evening will include entertainment, live music, hearty hors d’oeuvres, and cash bar. Valet parking will be available at the Museum’s Lancaster Street entrance for $5 per car. Tickets are $20 for WAM Members, $30 for nonmembers, $10 for students, $5 for youth (if purchased before January 15); after January 15 and at the door tickets are $25 WAM Members, $35 nonmembers, $15 students, $6 youth. Tickets can be purchased at flora2019.brownpapertickets.com. Flora in Winter, chaired by Worcester Garden Club members Kim Cutler, Kathy Michie, and Sarah Ribeiro, includes a variety of public programs—guided tours, lecture by Kim Cutler, demonstrations by expert floral designers, and a performance by the Seele Musicale Chamber Ensemble—all free with Flora admission. Other special ticketed programs delve more deeply into floral design techniques and require advance registration, as space is limited. All ages can enjoy making paper flower corsages at one of the Museum’s popular Art Carts. Materials and instruction are available so visitors can create a paper corsage to wear or bring home. Members of the Museum’s Salisbury Society enjoy a Chairman’s tour of the Flora arrangements, private viewing of the exhibition, Monet’s Waterloo Bridge, and complimentary admission for the evening. Open to Salisbury Society members only. Three different floral designers create flower arrangements from scratch inspired by a work of art located in the Renaissance Court. The finished designs will be on view for the duration of Flora and will be raffled off on Sunday, January 27. Every frosty January, the Worcester Art Museum is transformed into a floral wonderland. This illustrated talk by Kim Cutler, co-chair of Flora in Winter, explores the creative energy and teamwork that goes into making it a signature event-and the unique challenges talented designers face when planning their arrangements and working in a museum setting. WAM educators provide instruction on making paper flowers in this drop-in activity in Salisbury Hall. Wear your flower or bring it home. Seele Musicale Chamber Ensemble‘s roots were formed in November 2010 at First Unitarian Church of Worcester. Individually, the Seele Musicale musicians are teachers, music directors, orchestra members, church soloists, and chamber music enthusiasts. Their common bond is the intense love of the music they choose. Much of their interest gravitates around music of the 17th and 18th centuries. Docents with identifying Flora badges are available in the galleries with Flora’s interpreted pieces between 10:30am and 2:30pm, Friday through Sunday. Meet up with them at your convenience, or join a docent for an hour-long guided visit to Flora selections on tours leaving from Salisbury Hall at 11:00am, 1:00pm, and 2:00pm, Friday through Sunday. Valet parking will be available throughout Flora in Winter at the Lancaster Street entrance for a fee of $5 per car. Founded in 1896, the Worcester Art Museum’s encyclopedic 38,000 piece collection covers 51 centuries of art. Highlights include the Medieval Chapter House, Renaissance Court, and Worcester Hunt Mosaic, as well as the recently integrated John Woodman Higgins Armory collection of arms and armor. The Museum is internationally known for its collection of European and American art. It was the first in America to acquire paintings by Monet and Gauguin and one of the first to exhibit photography as fine art. As the one of the first U.S. museums to focus on collaborating with local schools, it has been at the forefront of engaging audiences and giving them a meaningful and personal experience for over a century. The Worcester Art Museum, located at 55 Salisbury Street in Worcester, MA, is open Wednesday through Sunday from 10 a.m. to 4 p.m.; and every third Thursday from 10 a.m. to 8 p.m. Admission is $16 for adults, $6 for children 4-17, $14 for seniors 65+, and $14 for college students with ID. Members and children under four are free. Parking is free. For more information, visit worcesterart.org.